Preheat the oven to 400 degrees F. Line a baking sheet with parchment paper. Using a fork, prick a few holes on sweet potatoes to prevent bursting. Place sweet potatoes on the baking sheet and roast for about 45-60 minutes, or until potatoes are tender but not mushy. Remove sweet potatoes from baking sheet and cool down. In a saucepan, heat oil over medium heat. Add onion, garlic and ginger, cook until tender and translucent. Remove from the saucepan and transfer to a food processor. Peel the skin off the potatoes, cut into smaller pieces and transfer to the food processor. Pulse until smooth, return sweet potato puree into the saucepan. Add milk, season with salt and pepper, simmer for about 5-10 minutes, stirring occasionally until well mixed. 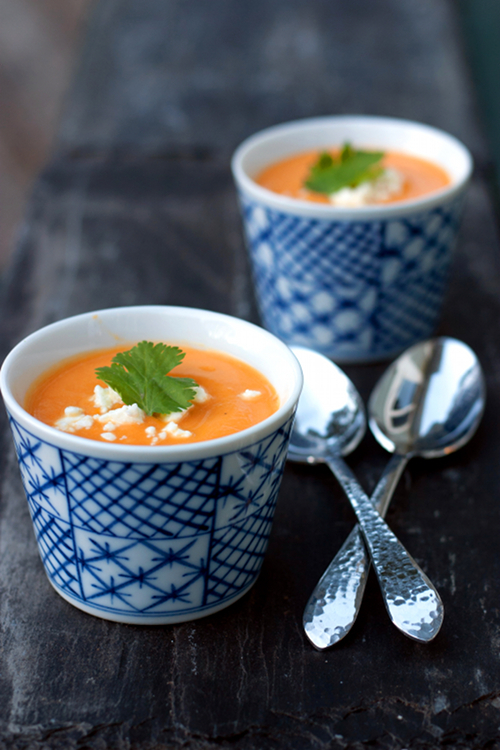 Transfer to individual bowls, sprinkle with crumbled feta and garnish with cilantro leaves. Sounds like a very rich creamy soup. Perfect for a rainy day! As there are dozens of mahjong games and out of all i found this free mahjong games the most original game of its kind and this game is the best one to play when you have a free time and meanwhile you can improve your skills in cards too. I love sweet potato soup.It's look so delicious and healthy.You may get more ingredients are easily available even online store like Amazon coupons with latest discount coupons.